Android now supports unit testing. Android unit testing runs on devices or emulators that adds extra time during development. 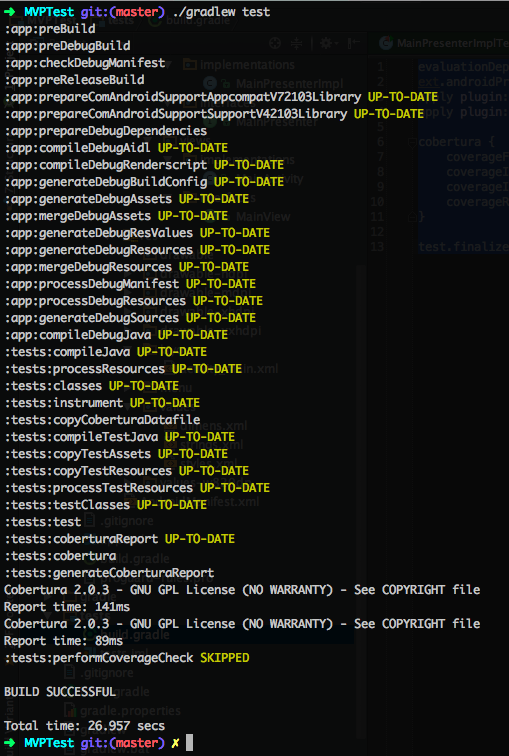 I'm a big fan of TDD and the way android testing is done does not help me much. Thanks to Robolectric, headless testing is now possible by leveraging gradle. I wrote this post as a result of trying out several different approaches that confused me. Hopefully this one will help you set it up better. First, current common Android development projects are tightly coupled. Most stuffs are done in the Activity or Fragment, blame the tutorials. This makes it hard for us to actually do unit testing since a unit test should be isolated. The tight coupling makes unit testing impossible. Then, come this approach called Model - View - Presenter (MVP). MVP aims at separating concerns. This component groups all data related concerns. This component handles data queries (be it via SharedPreference or SQLite) and network connections. The Model will be the provider of data for the Presenter. The presenter will then sends the data to the View. Just like the name suggests, the View handles all the presentation layers. You change the views, texts and contents in this component including navigation. The View should not handle view state and logic. This component handles the logic of the view and maintains the view state. The presenter will be the one communicating with the models and updates the view when data is retrieved. The MVP components are created using interfaces that standardize it. This separates concerns from each layers. The components communicates via the interfaces and does not connect directly to the implementations. This removes tight coupling of each layers. You pose no effect to other layers when you subsitute your implementation. For more references on MVP implementation try reading this blog post by Antonio Leiva. We need a special gradle plugin to set the environment for unit testing on Android. I use the Robojava gradle plugin by Gautam Korlam. It is simple and easy to set. 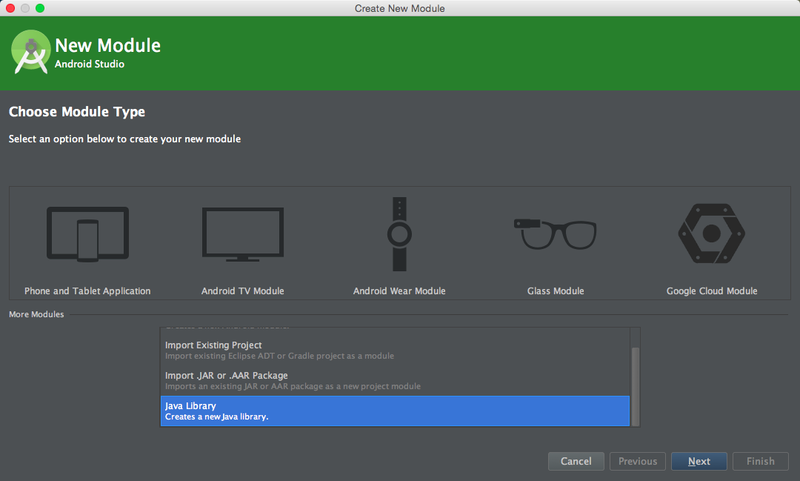 The first step you need to do is to create another module on your android project. Make sure that you select the Java Library module. I named my library tests. Now we need to tweak the gradle settings. Make sure that your new library is listed in the settings.gradle file. After that, we need to change the root build.gradle. That is the one on the root of your project. And there you go, it's ready. 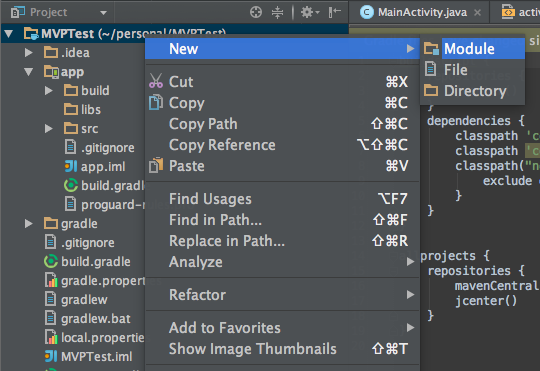 Anytime you wish to create a test, simply create a test on the presenter class, make sure it's a JUnit 4 test case and it's placed in the androidTest/ directory. 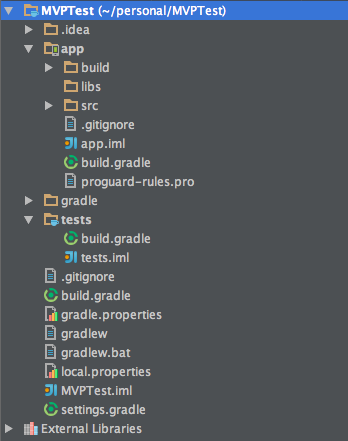 Gradle will build and run tests. If any of the tests failed the build will fail. I have the full example of this project on github. However, the project does not demonstrate the use of dependency injection as suggested by Antonio Leiva. Feel free to comment or ask me. Nice..Its informative about android...You have clearly explained about the concept..Its very useful for me to understand..Keep on sharing..